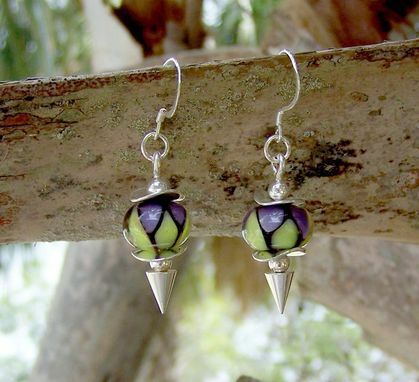 This sweet little pair of earrings are a perfect match for my Violet Aura Pendant. 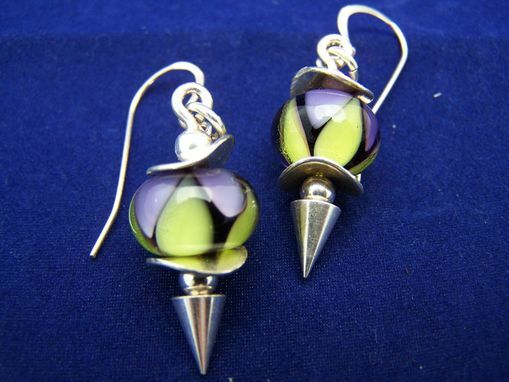 The lampwork beads are made on a base of black glass with violet and pea green triangle dots. The earrings measure 1 1/4" long with sterling silver ear wires. These earrings are assembled on "BeadHoppers." A great way for lampwork artists to display their beads. With this purchase you will get sort of a 2 for the price of 1 deal because the BeadHopper comes apart so that you can change the beads. As my friend Corina says, "Change your mind, change your bead." So check out my focal beads to see if you can find more beads to use on the BeadHopper. Chain not included. ♥I work with soft glass of many different brands and types. Generally I use a 1/16 sized mandrel unless otherwise noted. As a professional lampworker, my beads are annealed in my digitally controlled kiln for strength and durability. I personally inspect each bead for flaws and I thoroughly clean the bead holes with my trusty Dremel tool. ♥Bead sets are only temporarily strung to inspire your creative juices! Bead Hoppers and spacers used are included in the sale. ♥All photographs are color balanced to represent the colors as accurately as possible; however different monitors do display colors differently, and the photographs are sometimes larger than life to show detail.